Crest Canada, the toothpaste company, picked Toronto dentist Dr Natalie Archer to speak on their behalf in a Buchanon Group Medifacts infomercial promoting their Pro Health toothpaste. 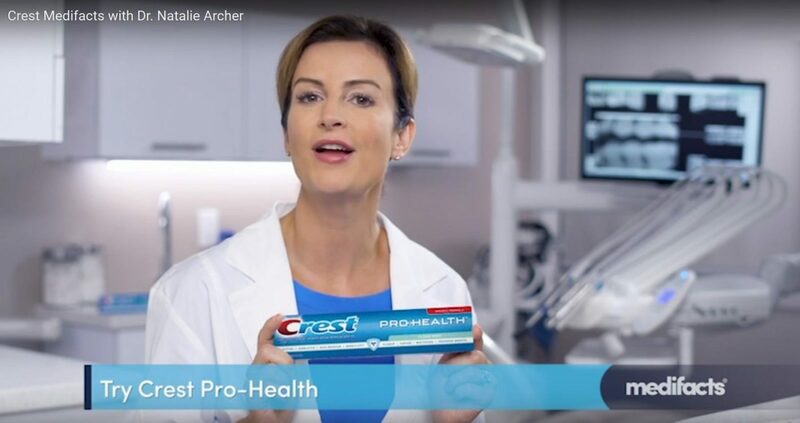 In this Crest Canada sponsored Medifacts clip, Dr. Natalie Archer DDS plays herself, a real life dentist in Toronto, as she breaks down the benefits of incorporating Pro-Health toothpaste with stannous flouride into your oral healthcare routine. 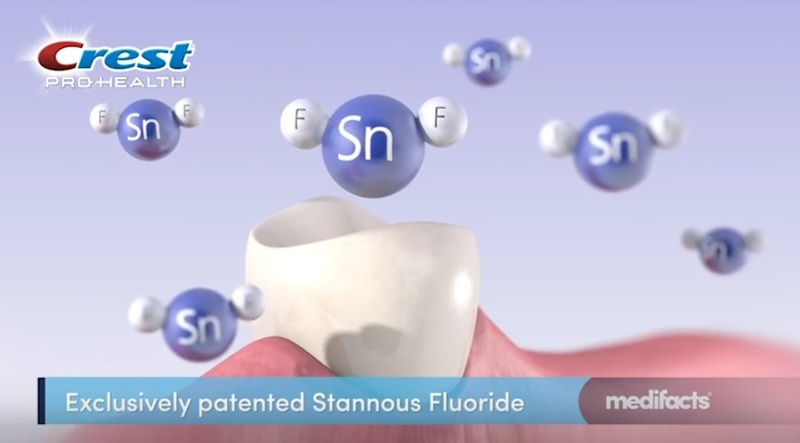 Stannous fluoride is a well known anti-bacterial agent that’s clinically proven to protect against gingivitis, plaque and tooth sensitivity, while still providing the trusted cavity protection you expect from Crest toothpaste. Stannous (from Latin stannum, ‘tin’) flouride is a chemical compound with the formula SnF2. Buchanon Group, makers of ‘Brand Power’, ‘MediFacts’ and ‘InfoTalk’ are leading producers of infomercials in Canada and around the world. .
Buchanon’s Medifacts video series has been around for a decade or more now. Their most famous video was shot in late 2014 when the ASPIRIN 81mg brand from Bayer received approval from Health Canada to claim it may help save a life in the event of a heart attack. The approved claim was, “If you think you’re having a heart attack, call 9-1-1 and chew 2 ASPIRIN 81mg”. So they made a Medifacts video to tell the nation. And it worked. In the following two years, consumer testimonials were received thanking the brand for sharing this message and for helping to save the life of loved ones. Consumers also relayed that when paramedics arrived on scene, they often asked if the patient had taken ASPIRIN.